I’ll be heading out to the American Christian Fiction Writer’s Conference on Friday which means I get to meet my agent and editor. It also means I get to meet lots of WRITERS! Including some that are favorites of mine. Which got me thinking about favorite authors. And since it’s Wednesday, how about favorite Appalachian authors? General Fiction – My hands down favorite is Ron Rash. He writes poetry and fiction both of which I love, but his novel Serena is one of the best things I’ve ever read. Christian Fiction – I recently raved about Chris Fabry’s Not in the Heart which isn’t set in Appalachia, but many of his novels are Dogwood particularly nice. Poetry – There’s Ron, of course, but give me Wendell Berry. I got hooked with Farming a Handbook but ALL his poetry is fantastic. 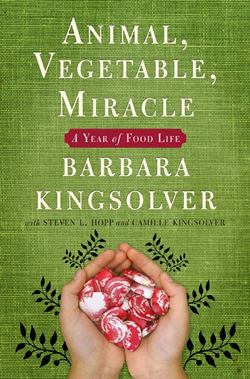 Non-Fiction – Barbara Kingsolver writes great fiction, but be sure to also check out Animal, Vegetable, Miracle an account of a year living from the earth. And then there’s Kathryn Stripling Byer’s poetry, Charles Frazier and Robert Morgan’s novels, well, I could go on and on. But that’s enough. Check them ALL out! ← Could you do it? I really enjoyed Jeannette Walls’ THE GLASS CASTLE memoir, set in WV, although at times I thought she might be exaggerating. I haven’t read that one, will add to my list. NOT your cup of tea. Doubt you would finish it. Too depressing. The family did live in Welch WV for a brief time, but that’s the extent of Appalachia. I didn’t even think of her as Appalachian, but you’re right! Amy Greene (Bloodroot) is my favorite Appalachian writer, although I love Ron Rash as well. I’ve been hearing about Bloodroot–got to check that out!